There is no motorcycle license needed and these trikes with automatic transmissions are very easy to ride. Cruise part of Las Vegas Strip and explore Downtown and Fremont Street on this guided tour. See some of the most popular attractions in old Las Vegas while riding along on a trike. Stop for a photo at the famous Welcome to Fabulous Las Vegas sign, and visit the Gold and Silver Pawn Shop, of the hit TV series Pawn Stars and the Carroll Shelby Museum. People of all ages will agree that this is an opportunity of a lifetime to experience a breathtaking ride while seeing beautiful views and a chance to create lasting memories! Guest will be picked up at select hotels on the Las Vegas Strip, then transported by van or minibus to starting point. After a short safety briefing and practice session, get ready for a fun and thrilling time as you take control of your very own trike motorcycle! Next, cruise over to Downtown Las Vegas and Fremont Street, home of the Fremont Street Experience, the Slotzilla Zip Lines, and Container Park. 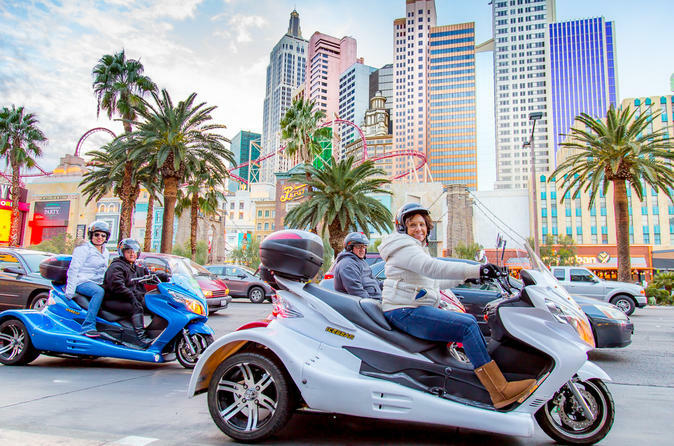 See what old Las Vegas has to offer on this approx 4-hour trike tour of the Las Vegas Strip. Tour is approx. 4 hours (hotel pick up to drop off), with approx. 2 hours on the trike (including practice time). For safety, you will have two tour guides – one in front and one in the back in a vehicle (4 or more trikes). Designated stops for quick breaks, pictures and sharing information are provided.